India is now devoting more resources and assigning greater priority to building connectivity in its immediate neighbourhood, External Affairs Minister Sushma Swaraj has said, amidst cash-rich China pushing its 'Belt and Road Initiative' in the region. Elaborating India's approach, she said it focuses on developing hinterland linkages and regional connectivity. "Under our Government's 'Sagarmala' project, initiatives we have taken include building new ports and modernising old ones, developing inland waterways and hinterland development are all aimed at a robust maritime logistics infrastructure. "Our eastern seaboard is a particular focus and can help recreate an integrated hub and spoke model for regional connectivity in the Bay of Bengal," she said. Carrying this focus beyond our borders, India is today devoting more resources and assigning greater priority to building connectivity, contacts and cooperation in the country's immediate neighbourhood, the minister, who is in Vietnam on a two-day bilateral visit, said. Beijing is building the USD 50 billion China-Pakistan Economic Corridor to link its Xinjinag province with Pakistan's Gwadar port on the Arabian Sea. India is also putting renewed emphasis in the "Act East" policy and the new "Think West" policy towards West Asia and Gulf region, she said. "Our Act East policy is at the heart of our eastward orientation and ties in with our broader approach to the Indo-Pacific," she said. "We therefore accord high priority to key infrastructure projects such as the Kaladan multi-modal transport project that links to Sittwe Port, and the Trilateral Highway that will extend to Thailand. 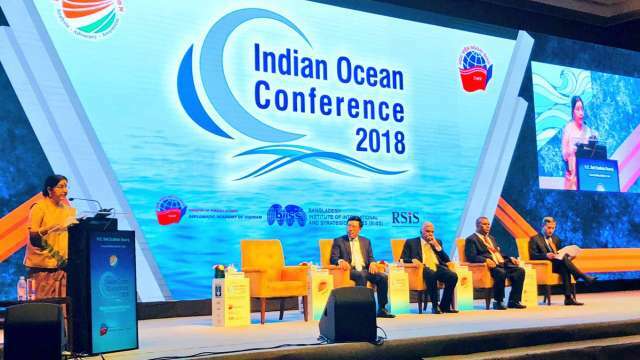 India is also looking towards a more sustainable future for the region by collaborating with the country's regional partners on blue economy projects, harnessing renewable energy, investing in development of desalination technologies and sustainably mining the ocean depths for marine minerals. In these engagements, India is guided by the development and security priorities of the country's partners. "Our approach is based on inter-dependence rather than dominance or narrow reciprocal considerations," she emphasised. "We support responsible and transparent debt financing matched by responsible lending practises," she said, amidst global concerns over China's initiative to build railways and other infrastructure across Asia against complaints it leaves host countries with too much debt. "We understand that following universally recognised international norms, transparency, openness, financial responsibility, and promoting a sense of local ownership are essential for better and more sustainable development outcomes," she said.